Stripper header with two rotors is intended for harvesting all kinds of technical crops, grains and herb seeds. Grains: wheat, barley, rice, rye, oat, triticale. Seeds of fodder grass and medicinal plants: alfalfa, sainfoin, zerna, melilot, clover. By individual stripper header can be produced for mounting other combine harvesters. Stripper header is a unit used for threshing the standing plants during harvesting. It consists of a frame on which is mounted the front rotor (deflector), stripping rotor and auger. Both rotors are equipped with nine rows of stripping combs. The front rotor is used for deflecting grain to auger and pan. The stripping rotor is used for direct stripping of the crop. Both rotors rotate in opposite directions to create vacuum effect for aligning the stems in the area of cropping. Auger transporter is used for transporting the grains and seeds to inclined camera. The auger is equipped with slip clutch to prevent failure of all the machinery in case of jamming or locking. Working area of rotors and auger is covered with casing to prevent grain (seed) losses. Working parts of rotors and auger are driven by cardan shaft and chain gear. 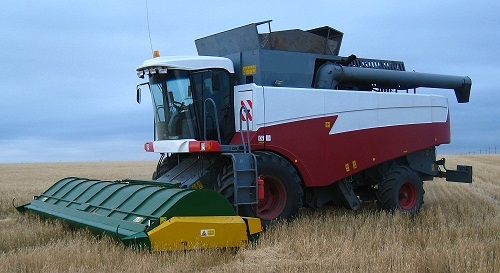 The header is mounted on a combine by hanging it on an inclined camera of a combine. Principle of the header operation is to thresh the standing plants by stripping it with combs located on a stripping rotor of a header. The stem of a plant is captured by combs and stretched through slot between their cogs to extract grains (seeds). Thus obtained cereal mass consists of 80% grain and seeds. Under inertia force and air flow it moves to auger and inclined camera and then to thresher of a combine for final threshing and separation. field supervision of the reaper.